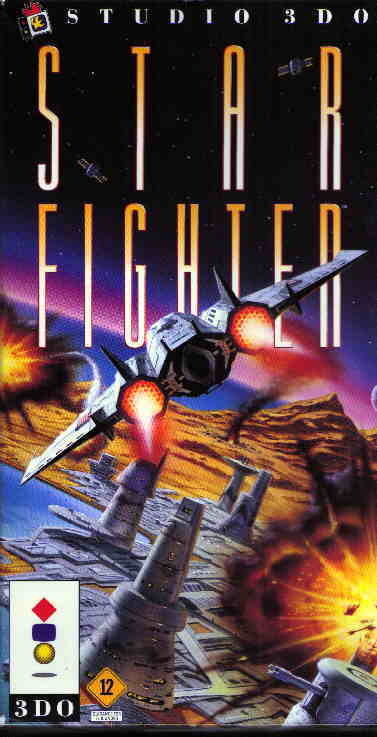 Starfighter is about the closest a game of this genre has come to what I'd always hoped a game of this type would be. The name says it all, but I'll tell 'ya anyway; it's 3d space combat. Similiar to many games of this genre that came before from the one that started it all, StarRaiders, on Atari systems and computers years ago, to The latest Wing Commander and Colony Wars games of today. So what makes this one special? Other than Polygon graphics and totally off-rails, go-where-you-please, worlds? Well, I'll tell 'ya. First and foremost, Starfighter has missions both on planet surfaces and deep space. Also, while above a planet's surface, you can fly up, out of the Atmosphere and back in again(usually to attack some satellites). The feeling you get when your diving from +100,000 feet and narrowly swooping through a mountain pass, through the clouds and just above the ground without crashing is amazing. Your ship will seem a little slow at first, but upgrades of engine pods and to the engines themselves will soon make it possible to zoom above the landscapes at impossible speeds. The frame rate is pretty speedy in this game, slowing only occasionally, but I'd say it goes from 15fps at it slowest(not bad) to well over 30fps in deep space. Just a tidbit for those of you who's eyes may glaze over when reading frames-per-second(fps) not knowing how to compare it. Well those old home movies that dad used to make on his 8mm camera ran at 15fps. Motion pictures(in the theatre) are usually 35mm and they run at 24fps. Video and DVD run at 30fps(motion pictures are modified to run at the higher framerates when recorded on these formats). Many of the early 3d games that your used to playing on the 3DO average between 10 and 20 frames per second(that was the standard back then). Bladeforce states on the back of it's box that it runs at 24fps or motion picture quality speed. Later games and systems have since pushed the limits of our tv's at 60fps. Well enough of that, back to the review. So this game is not shabby in it's smoothness, no "jerky" framerate here. This game shines in the gameplay department, while it is a tuff game, the early levels aren't difficult and there are a LOT of levels, actually, I'm not sure how many. It doesn't say anywhere and they are set up in pyramid style, level 1 at the bottom and going up to fifteen and then another set of 15 planets appear when the first set is completed and I have never gone beyond this set so I don't know what lies beyond. The dogfighting part of this game isn't pulled off to well in this game though, it's not like Wing Commander where you can get on their tail and chase, it can be done, but they fly to fast and matching speed is difficult at best. You'll find yourself locking on with missles and firing off a few just to get rid of them. There is no playing chicken with them, they'ed as soon kamikazee you as to shoot you down. But the other aspects of the game like attacking ground targets and huge space stations and spacecraft carriers and the huge assortment of weapons makes up for that. You can shoot anything including the ground and it blows up or shows visible damage. You have control of wingman in many missions as well that you can keep by your side or send out after targets.As far as weapons and enemies go, it's in the game. You pick up gem power-ups after explosions and collect parachutes out of the air for power-ups as well. You have a map and radar and mission briefings, the usual. Great frame rate, everything is texture mapped, lots of hills and mountains and trees and buildings and seas, tanslucent clouds and rumbling waves, rainbow explosions and chunks of debri, afterburner and rocket engines flair, leaving a stream of flame in the air...special effects galore. I do think the texture mapping could have been a little more realistic like shockwave, instead of an almost Mario World look to some of the textures, others are okay. The graphics rock anyway. The sound is stereo surround magic! Fantastic techo-industrial type music is always playing (if you want it to), sound effects are excellent, all of them. Everything sounds just as it should or you would expect. The control is good but slippery, once you get used to it, it becomes precise. All of this improves with power-ups. It's flightstick compatible, I don't own one so I can't tell you how it is though. This game is a joy to play if you like flying and space combat shootem' ups at all. Studio 3DO put a lot of effort into this game, as they did with most of their releases. The bigger the tv and sound sytem you have the more you will enjoy this game too. Highly recommended, no 3DOer who is even vaguely interested in this genre should be with out this game. That goes for Saturn and playstation people too, this game came out for those systems after the 3DO was discontinued so look for it no matter the system.